So what do those under-age drinkers drink? The Echo last week ran with a story about the Police confiscating alcohol from under-age drinkers. They published a table of what was taken and had a picture of the haul. Now was it like what the Tories were saying? That the problem is with alcopops and super-strength booze? 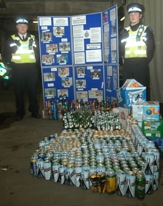 and whilst the beer and cider figures don’t separate normal from strong, the picture clearly shows a large number of cans, bottles and boxes of Carling, Fosters, Stella and Carlsberg.